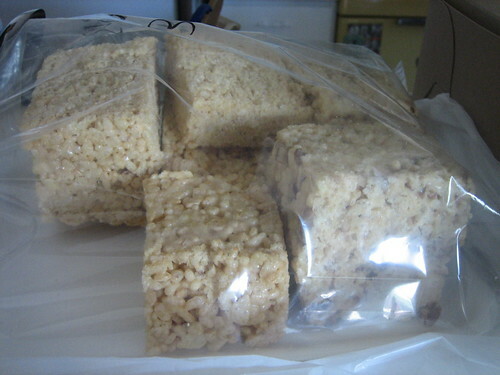 We’ve been craving – no, fiending for – Rice Krispies treats for the better part of the week. We stopped by the bodega* at the end of our street for ingredients one night, but couldn’t justify paying $5 for a box of cereal and $2.50 for a bag of marshmallows when buying two individual treats (less than $2) could sate our cravings while preventing further treat binges. True to form, however, the individual treats only made us want more treats. Isn’t that the way it always goes when fat and sugar are involved? And so I found myself making Rice Krispies treats at 9 o’clock this morning, melting butter and marshmallows while Shane did the breakfast dishes. In an attempt to be fancy, I spread melted butterscotch chips on one half of one pan, and melted peanut butter chips on one half of the other. The melted gooey everything had barely cooled before Shane sliced out a peanut butter coated treat – and then asked me if we could please wrap up the treats in controlled portions. Sure thing. And if this is the only Christmas baking I get to this year, I think that’s just fine. In a large saucepan, melt the butter, then add the marshmallows and stir until melted. Add the Rice Krispies and stir until coated with sticky goodness. Press into a 9×13 pan or two 9×9 pans. If you’re feeling fancy, melt 1/2 cup chocolate, peanut butter, or butterscotch chips over medium heat, then use a spatula to spread as thinly as you’d like over as many treats as you’d like. 1/2 cup chips should thickly cover half of a 9×9 pan. *Side note: I refer to the corner store as a ‘bodega’ because I like to pretend we live in a real city. In Michigan, they’re known as ‘party stores’, which Wikipedia claims is a hold-over from Prohibition.